It is estimated that the Hoba meteorite fell to Earth around 80 000 years ago and weighs around 60 tonnes. Its discovery is said to have been pure chance with the story relating that the owner of the farm Hoba was ploughing his land with an ox. His plough came to an abrupt halt after a metallic scratching sound. In 1920, scientist Jacobus Hermanus Brits identified and described the meteorite as being made up of 82% iron 16,4% nickel and 0.76% cobalt and being around 3 m² and 1m in depth. It was proclaimed a national monument on 15 March 1955 and is located 19km from Grootfontein. 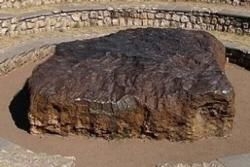 It is considered to be the largest known meteorite (as a single piece) and the biggest naturally occurring piece of iron known on the Earth's surface.